Posted by Eddie & filed under Mountains & hills, May 14 2012. 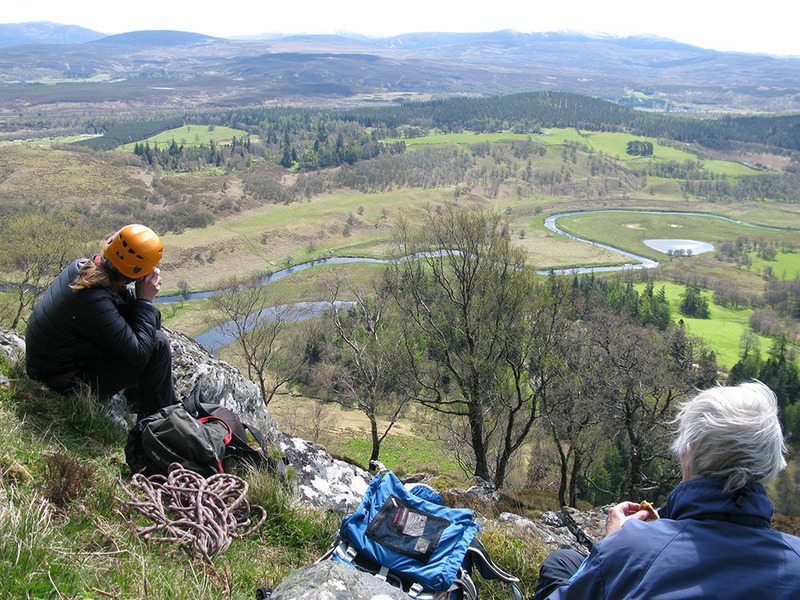 Last weekend I attended a two-day Introduction to Scrambling course at Glenmore Lodge. I had undertaken this course before, in August last year but was only able to attend for the first day. On that previous course the instruction group spent the day in the Chalamain Gap in the northern corries area of the Cairngorms setting up anchor and belay points in the steep bouldery ground and setting up indirect belays using the rope alone, much as for ML training. On the first day of this course the group was based on the crags of Creag Dhubh near Newtonmore. The Cairngorms had an unusually extensive cover of snow for mid-May, down to an elevation of about 500m, meaning that many good scrambling routes and sites were under snow so they were not suitable for this introductory summer course, forcing the course instructor to go a bit further afield. 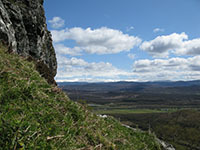 The crags on Creag Dubh are also at a relatively low elevation (about 400m), whilst still presenting many challenging sections of scrambling as well as many full rock climbing routes. The weather on this day was perfect, with blue skies and little wind, with fantastic views of the snow-capped Cairngorm summits to the east and Creag Meagaidh and Ben Alder to the west. On Creag Dhubh our group traversed tricky boulderfields and steep grassy sections as well as setting up some simple anchor and belay points using a rope. We also practiced waist belays, direct belays and the use of a sling and karabiner with clove and italian hitches to set up anchors for climbing, lowering and abseiling, all things that were new to me and which were not covered on the previous course last year and which go beyond the ML syllabus (but which are very useful for groups on scrambling routes). After the day at Creag Dhubh the group spent and hour in the indoor climbing wall at Glenmore Lodge practicing basic climbing techniques, which was something I hadn’t done since the age of about 20. On the second day the weather had considerably worsened, with storm force winds and heavy rain forecast. However the temperatures had risen considerably causing a lot of the snow in the Cairngorms at lower elevations to melt overnight meaning the group was able to spend the morning on a steep area of granite crags and boulders on the east side of Coire na Ciste in the northern corries. This was the same crag that I had spent a day on on an ML refresher course in May 2010 (see the previous blog posting ‘ML refresher course‘), although on this course the group undertook considerably more difficult lines of scrambling ascent, some unroped, and some protected with anchor and belay points set up with sling and karabiner. Some of the moves required to negotiate the steep boulder steps were quite tricky in the strong gusty wind and I was right at the limit of what I could achieve. A lot of this morning was spent on scrambling that was not really any different to rock climbing, and was probably amongst the most difficult things I’ve ever done, mentally and physically, since I was in my early twenties. Due to the weather conditions, the afternoon of the second day was spent by the group in the indoor climbing wall at Glenmore Lodge but I chose to spend the remainder of the day outside, going for a short hike in Glenmore Forest which provided some shelter from the wind, walking along two large glacial meltwater channels which were carved out at the foot of the minor summit of Airgiod-meall at the end of the last ice age. Carol and I were at Feshie for the 1st week in May and I can’t remember the Cairngorms looking quite so stunning. The snow was fresh, pristine white with a well defined snow line. Normally by that time of year its looking grey and yellow with patchy coverage.